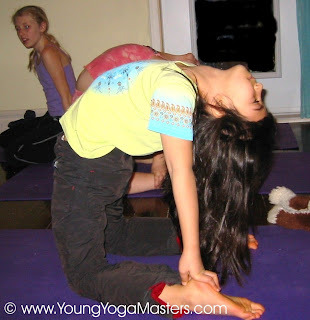 There’s a question that every new kids yoga teacher asks when doing kids yoga: How do I teach kids yoga animal poses? Animals themes like bats and Spiders in this post: Halloween Yoga for Kids from the Childlight Yoga blog. I have to admit my original weekend kids yoga teacher training didn’t include a yoga animal story. Yoga animals are part of other themes like in the Story of the Lion Cub who Was Raised by Goats – we do lions and even a goat pose! But in my desire to do a kids yoga training with new information than what was already out there, animal yoga did not make the first module of training. Animals and yoga go together so naturally, I mean the poses are named after animals, so it really is a fundamental of yoga. So I cover it here and include animals in the 95 Hour Training manuals now too. Camel Ride – a basic warm-up in Kundalini Yoga, sit in easy pose, hold your ankles, inhale lift your spine forward and up, exhale and relax your spine back – as if you were riding on a camel. Elephant taking a Shower: stand up and make a trunk with your arms, keep your legs straight and dip your trunk into the imaginary watering hole in front of you, then lift your trunk up and spray the water like a shower. Frog: squat and stretch your legs like a frog warming up and then jump! Cobra Pose: there is nothing more fun in preschool yoga than to talk to each other by wagging our tongues. Downward Dog: there are so many options with downward dog for individuals, partners, and groups. Butterfly Drinking Nectar: sitting, put your feet together and knees bent wide apart. Flutter your legs up and down like a butterfly. Then move your chest to your feet and drink the nectar from a flower in front of you. Cheetah: move quickly on all fours like a cheetah running across the land. Camel Pose: See the picture above – an advanced pose, but a good challenge in the right setting. Unicorn: Make your hands into a magical unicorn horn over the centre of your head then gallop. Monkey Eating Bananas: a favorite with preschool children, and teachers, because you get to do your monkey sounds (oo oo oo, aa aa aa). We start squatting like a monkey, then climb an invisible tree and stretch to pick bananas, climb back down to a squat and eat our bananas. Start an animal yoga class by saying, “Put your hand up if you like animals.” You’ll get so many hands you may have to limit comments from the kids, and quickly find out animals they like. You can also let the children know that some feel the yoga poses came from watching how animals stretch. Then invite the children to do some animal yoga. I’ve never had young kids say no, although the older kids (10 – 12 yrs) may lose interest in this topic. You may want to take it up a notch by doing endangered species yoga, or let them teach the poses. Then you’ll be off to the races, or should I say the Zoo, going through all the poses, plus the ones the kids make up. What are your favorite Animal Yoga Poses and Games to teach or do? Fantastic work. What a great website and resource, I have thoroughly enjoyed the articles, advice, and personal stories and I’ll definately be re-visiting frequently. Thanks for your ideas – so many great ways to do animal yoga! It really is a fundamental of kids yoga. One of my daughter's (age 4) favorite things to do with me at home is to play the Yoga Garden Game. There is one part of the game where the player gets to make up a pose of their own and the other players guess what it is. My daughter, and many of my past students, would LOVE to make up different animals and have the class guess. It's a fun way to incorporate all of the kids' favorite animals. If they say one that you know has a pose, like snake, butterfly, dog, etc. then you can have that child lead the pose. If there is no known pose, have the kid make one up. Either way, have the kids take turns and ask the class to call out the pose name, whether they already know it or are guessing for the first time. Of course, animal sounds will help for younger kids to guess the right answer. Another fun thing to do with all of these poses is to create a "Yogi Says" game. It is a review of poses learned, plus a listening game that requires focus to only move when the leader calls out "Yogi Says" before the pose direction. This is a game I learned from my mentor Lisa at ChildLight Yoga. I use lots of animal poses when teaching children's yoga – we go on Safari in Africa, tour through India, visit the Amazon, the Pet Store, the Zoo, and many more. Animals and kids go together beautifully. Sometimes we focus on crawling and flying creatures or look at life cycles from seeds, to plants, to rabbits & wolves.In fact I doubt I teach a class that doesn't have some type of animals in it. The book Dear Zoo is great to do yoga to. It has similar animal poses to the ones found in yoga. Hi Tania – thanks for the suggestion, I’ll check it out. It looks especially good for the younger kids. These are great! I am not a Yoga teacher, but I used to teach dance to 5 and 6 year old's. I would often start class by making them do Yoga poses because I found it was the best way to get them to stretch and warm up without being bored. They absolutely LOVED making the "animal shapes," and it was so cute to see them remember how to do each one, just by me calling out the name. One they especially liked was the Full Locust pose…except I called it "flying like superman" (or supergirl). We'd all lay down on our bellies & I'd ask the kids where they wanted to fly today. They'd shout out places like "Disney World," "Grandma's House," and sometimes even "The Moon!" So we'd count down to blast off, and on the count of three we all stretched up into locust as we "flew" to each of the destinations. It was so much fun and the kids loved it! Thanks for the comment – I agree that kids seem to love any pose that uses their imagination. I like the Superman pose too!